(@ 2003-2018 Lynne Sprinsky Echols. This excerpt from Chapter One is used with the author’s permission and and the entirety will be posted in a series. 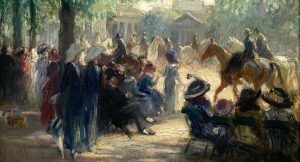 The author describes in fascinating detail the three months that, along with her friend Meredith, she spent in intensive training with Herr Egon von Neindorff at his world-renowned riding school in Karlsruhe, Germany…in search of “a good seat”. Feature image presumed by Johann Elias Ridinger.) Please see Part I here: https://www.kipmistral.com/a-good-seat-three-months-at-the-riding-institute-von-neindorff-by-lynne-sprinsky-echols-part-i-in-the-series/ and Part III here: https://www.kipmistral.com/a-good-seat-three-months-at-the-riding-institute-von-neindorff-by-lynne-sprinsky-echols-part-iii-in-the-series/. We hit the hay last night about 10:00 p.m., but again I couldn’t sleep. The phone rang at 11:00 p.m. for Meredith but the conversation must have been cut off again almost immediately because all I heard was, “Hello?….Hello?….Hello?” I think I must have hit the speaker phone button in the dark while handing the phone across the bed to her. Then Meredith hung up and was almost immediately asleep again, whereas I was wide awake for another hour or so. We were awoken at 7 a.m. by the pealing of church bells across the street. That reminded me of the bells of the Frauenkirche in Munich when I was a child, and ordinarily I love the sound. But this morning, I could have done without it. Shortly thereafter Meredith’s alarm went off, so we hauled ourselves out from under our warm duvets and got ready to go. We’d eaten all the bread, so I just had coffee and then picked up a fresh pretzel at the little bakery on the corner of Reinhold Frank Straße and Kaiserallee, across the street from the streetcar stop at Mühlburger Tor. We got to RvN by 8:30 and it was very quiet; not a soul was in evidence except one old man who was feeding the horses. But soon another man showed up, the same guy we’d seen riding yesterday and the day before. He got on the tractor and dragged the indoor school. At 9:00 it became evident that we were not, in fact, riding. 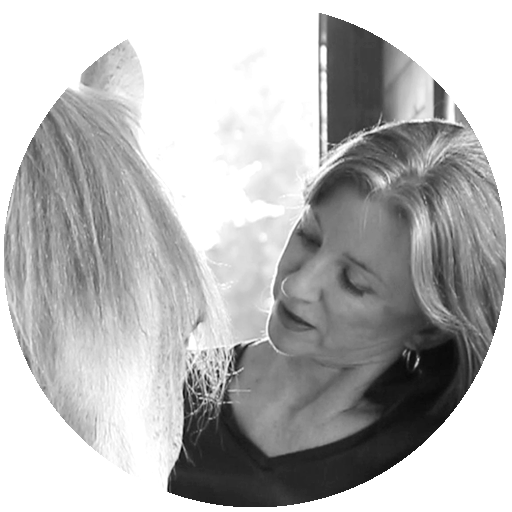 I couldn’t stop yawning – no wonder, since it’s been two nights since I slept well, Tylenol P.M. not withstanding – so I went into the tack room where it was dark and a couple of degrees warmer, and sat down and closed my eyes. Meredith wandered back in after a while to say she’d seen Melissa Simms, who’d said that Herr vN had told her that we were to ride at 10 instead of 9, so that’s what Melissa assumed we would do. At about 9:30 we peeled off our extra layers and put on boots and helmets, and about ten minutes later, Jan came to tell me I would ride a horse named Odin. He deputized another young woman to help me get him tacked up and ready, which happened lickety-split, so that by 9:50 we were in the arena getting ready to mount up. Both the young woman and the man we’d seen on the tractor helped me aboard – Odin didn’t care for the mounting block and I haven’t mounted from the ground for about a hundred years. (In addition to being creaky and chubby, I’m of the opinion that it’s not good for the horses’ backs.) Jan came back in, too, and offered to give me a leg up but frankly, I am too uncoordinated for that approach so we just let the near side stirrup leather down as far as it would go and I got on from the ground while Jan counter-weighted the off-side stirrup. The young woman attached the side-reins that Odin apparently requires for all riders, Jan handed me a Gerte (stick) and we started off walking on the buckle. Odin was very active and squirted out from under me after less than a minute, surprising me. I managed to get him back under control, but not before Tractor Man (who turns out to be an Austrian called Herr Smeykal), barked at me. “Hände tief halten!” (“Keep your hands low!”) he shouted. Well, yes, of course, my hands had flown up as I went fetal at the outset of the surprise spook. I tried to remember to keep my hands low the other times Odin spooked at something. I must say he was really pretty easy to stay aboard, however. When he spooks, he just squirts straight forward — nothing “dirty.” Thanks be to God! 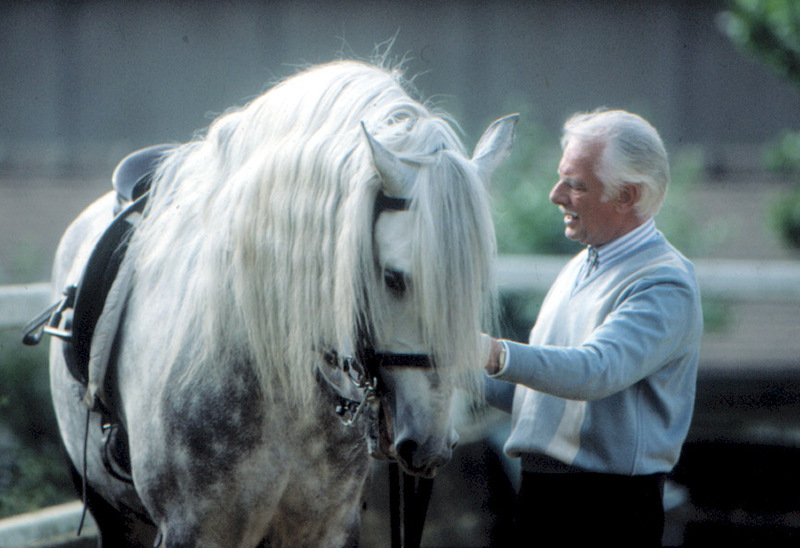 Under Herr Smeykal’s direction we spent about 50 minutes working in trot, doing circles, serpentines, and changes of hand, and occasionally breaking to walk on a long rein. At about 10:50 Herr vN arrived at the little window in his office that overlooks the arena, occasioning another spook on Odin’s part as the microphone emitted a sudden crackling sound. “Schön guten Morgen!” (“A very good morning!”) blasted forth in Herr vN’s distinctive tones. Then the real lesson began. We began with more walk on the long rein, and then were directed take up the reins. Next, we transitioned into working trot and Odin was against my hand the whole time. In the warm-up I noted he was very heavy on the left rein and tried to give it to see if he would soften. No go. I tried an open, leading rein coupled with an attempt to get him to bend in the ribcage using my inner seat bone (forward) and inner leg, and even a couple of taps with the stick. Nothing succeeded very well, unfortunately. After a short time, Erik Herbermann came in on a lovely gray. He helped to translate for Meredith the Kommandos that Herr vN was giving, as well as making an occasional corrective remark to me. We did some turns on the haunches from the halt, and then “in motion” from an almost-halted collected walk. Then we did some from the trot (first coming to the collected walk). Next, we did some trot work asking for longer steps on the long sides of the hall and shorter steps on the short side. Poor Odin was really hanging on me and I would have liked to have come to walk and softened him up some, but was obliged to ‘stick to the program’ and so never did really resolve it with him. Erik noted that I was pulling my stomach in (and so collapsing my front line) and that I had too much tension in my forearms. I was aware of the forearms but having the devil of a time figuring out how NOT to pull against Freight Train Odin while still executing the exercises required by Herr vN. I’m really feeling the 18 months I’ve had “off” from serious riding because of Ben’s illness. Only later did I realize I wasn’t allowing my seatbones to be pulled into Odin’s back by his own heaviness. When the canter command was given it got even worse, because Odin shot off like a rocket from what I had thought was a pretty soft leg aid, but we had been instructed to make transitions at will, so I kept bringing him down to a trot and then a walk before trying again. Eventually we got a decent departure when I put him immediately on the circle simultaneous with asking for the departure from a well-bent state. Then we were instructed to change directions again (Handwechsel) and before I even got one right-rein canter departure accomplished, Herr vN told us all to walk on the long rein again. After a short walk break we put the horses back on the aids (which was a laugh in my case, because Odin hadn’t really been on the aids at all yet that morning). Then we lined up across the center line, facing the large arena doors. 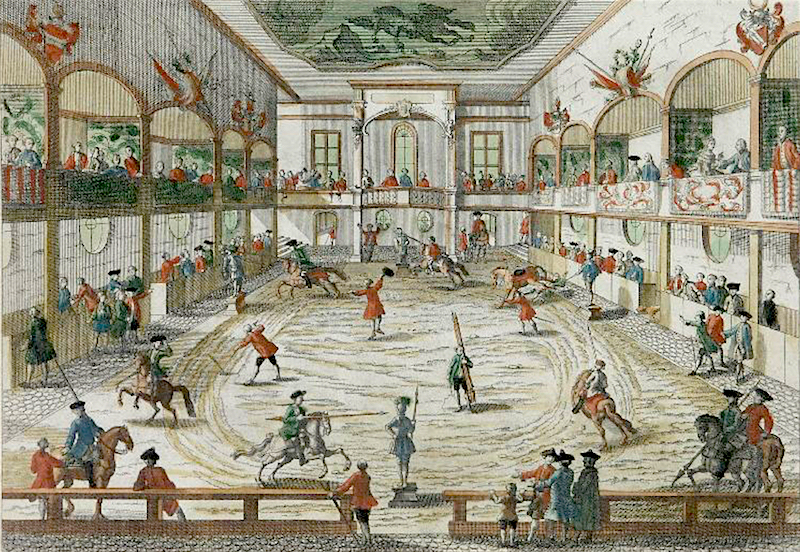 We were told to dismount (einrücken), run up the stirrups, give the horses a sugar cube – there’s a large box of them in one of the beautiful, arched, brick window sills — and take them back to their stalls. I was relieved not to have to do the longe lesson right away, as Meredith had conveyed that Melissa had other things to do that morning and we could have the longe lesson in the evening instead. I needed a break. A short conversation in the tack room with Erik Herbermann revealed that it is customary to let der Chef know when you arrive and when you depart. You go to his little window and say good morning or good-bye, Erik instructed — no need for a long conversation. Erik also said that Herr vN wanted us to stop by and arrange for the evening’s longe session, so we did that and we advised to return at 5 p.m.
On the way back to the hotel we stopped again at the Intermarché for more water, milk, and soup, as well as some oranges, bread, pre-washed salad mix and salad dressing. Meredith eats a very healthy diet and her influence will be good for me. Not only does she want to go out and do things when I, left to my own devices, would probably be taking a nap, but she is very mindful of her budget so she’s keeping me out of the Konditorei where otherwise I would be on a daily basis. Of course, I could go on my own but that’s not nearly so much fun. After lunch we strolled down to the Europa Platz where the main post office is, and Meredith bought some postage for postcards to send home. We both visited the ATM and I ran into a bit of a snag; I wanted to take another €500 out but the machine said (in English) that I had surpassed my withdrawal limit. That was confusing, because I had taken €500 out upon arrival. (The lessons, in blocks of ten, go for €240. Normally, a riding lesson bought “by the once” runs €28, and so does a 30-minute longe lesson. If you buy the 10-lesson package, you save a bit, but at two lessons a day, we’re going through a package in five days, so cash is going out rather quickly on that account alone. Then of course there’s the grocery expense, and the streetcar passes, etc.) I tried for €400, and it was still no go. Deducing that the machine was low on cash, I settled for €100 and let it go at that. Next we stopped off again at the internet café, and I was pleased to see that Bill had in fact gotten my message about the bags, and wanted to know if they had been recovered. I wrote him back that all the bags had arrived, and that I was minus a few things but not enough to warrant filing a claim. 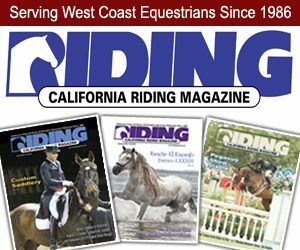 I was able to log on successfully to my favorite horsey bulletin board, Ultimate Dressage.com, but I couldn’t get my post to send. A “page not found” message kept coming up. Nothing worked until I reduced my post to one line; that went through fine. Now I’m wondering whether I will only be able to post one-sentence comments. Even long e-mails take forever to send, and when you’re paying by the minute that becomes a problem. I asked the desk attendant at the café whether I could bring my own computer in and hook it up, but she said that was not allowed. Then I asked whether I could upload from a CD and discovered that will cost an extra €1. Well, okay, I guess I can stand the freight. Whether sending something of some length from the CD will be possible is anybody’s guess at this point. But if it works, and the message gets lost in cyberspace, at least I won’t have to key it in all over again. We returned to the school for an evening longe session with Melissa Simms. As directed, I brought Odin out again but he was definitely “off” on the circle so we put him back and readied a horse named Mara. The barn help seemed surprised that we would use Mara. We soon discovered why. Melissa said she would longe Mara a bit before Meredith got on, which was smart, because the mare took off as though she’d been launched from a catapult, and then slipped and fell on her side in the tanbark. She got up again right away, unharmed, but then proceeded to play on the longe at trot and canter, occasionally kicking up her heels and buck-farting away, for a good 20 minutes before she settled. Then Meredith climbed on and I began videoing. The saddle was sitting completely wonky – about three inches higher in the front than in the back. Poor Meredith had the devil of a time staying with the motion; she kept getting thrown back on account of the saddle sitting so cantle-low. And every time Meredith fell back, Mara would stop and do a levade. Afterwards, Meredith told me that she had mentioned the saddle fit to Melissa at the outset, but apparently it didn’t register, because when Meredith finally got off, after a good 40 minutes, and Melissa took another look at the saddle, she said, “Oh, you poor girl!” We watched the video afterwards and counted 25 individual levades. In between, Mara would trot a bit, then stop, balk, and go up in another levade. Near the end of the session, she went up so high that Meredith almost slid off backwards. It was an interesting session, to say the least, and I’m only slightly embarrassed to admit that I’m glad it wasn’t me doing the riding. Melissa assured me that we were not going to use Mara. “Oh. Well, in that case,” I said. “If you think I can handle it.” So we put Mara away and got out Thais, on whom Meredith had been longed on Day One. Melissa was wonderful at putting me at ease, and I soon felt very comfortable on Thais. We again did lots of arm circling at the sitting trot, first one arm and then both. At the end she took him off the longe and let me ride him around the school a few times. Thais went well and felt very good under me. Melissa did have me keep the side-reins on, explaining that she didn’t think I would be able to keep him connected without them. She’s probably right. Once home, we made another noodle dinner, washed down with a nice little Rhein wine and accompanied by fresh oranges for dessert. Then I ran a hot tub (and it was hot, to my delighted surprise), and I finished off the wine while soaking. I took a couple of Tylenol P.M. before climbing into the bath, and the warmth, the wine, and whatever it is they put in those pills combined to make me sleep like a log all through the night. We had signed up for a riding lesson at 10 a.m., and arrived about 9:15 to give ourselves time to clean our boots first. Meredith drew a big, raw-boned bay gelding named Galant, and I again had Odin. We had about 20 minutes on our own in the hall, just walking on a long rein, before Herr Smeykal came in to give us some directions. That lasted another 20 minutes, and then Herr vN arrived and the real lesson began. We trotted, changed rein, performed voltes, did verkürztem Tempo Trab (short steps trot, but not true collection), did a few turns on the haunches to either side, trotted on, did a few reinbacks, trotted on…. about another 50 minutes worth! Odin and I got along better than yesterday; he was less against me, but he is still tremendously stuck in the left jaw. His tempo needs to be slower than what he offers, and after Erik Herbermann arrived about 15 minutes into the session with Herr vN, I managed with the help of some of his suggestions to find a better tempo. Odin grinds his teeth often and so I was working on figuring out what sets that off. If I soften the rein that is heaviest, sometimes he stops grinding, but not always. If I drive more with the left leg (on his stiff side), and give with the left rein, he stops grinding but also flexes to the outside. So this obviously needs more work. But all in all, when we quit after a solid hour and a half in the saddle, I was pleased. After putting the horses away, we arranged with Melissa and Herr vN to have a longe session for Meredith alone. I’m pooped after such a long session, and my seat is hurting from that saddle! The longe session will be given by Herr Smeykal because Melissa has a dinner to go to or some such. Herr vN said for me to talk to Herr Smeykal directly to arrange things, and then Herr Smeykal sent me back to ask Herr vN which horse we should use. Herr vN had disappeared, so I got one of the stable girls to tell me how to contact Melissa: you dial “3” on the stable phone and it rings in Melissa’s apartment over the barn). Melissa said we should use a horse called Monteaura (pronounced “mon-tay-OW-ra”) and to tell Herr Smeykal to longe her first. Herr Smeykal seems a bit taciturn – not quite so smiling and friendly as everyone else here, but when I relayed Melissa’s choice of horses, he agreed to meet us back at the school at 4:30. So, home for lunch. I was down to my last Brötchen (bread roll) so we stopped for a few more, and then stopped again down two doors for a 2-pack of sponges and some disposable wipes to split for use between boot cleaning and kitchen duties. I also bought a little bottle of water so that I can take some with me to the barn. Breathing through my mouth during all the exertion makes me dry out like the Sahara and I’ve been mooching water from Meredith’s Nalgene bottle, which she carries with her everywhere. Now I’m catching this journal up after we’ve had lunch and the Putzfrau (cleaning woman) has been through with the sweeper. She told us we can take our laundry to Reception and they’ll get it back to us after a couple of days. I think we’ll wait until the end of the week, and do a week’s worth all at once. I’m going to put my feet up for a bit before we leave again at 4:00 to return to the school to subject Meredith to Herr Smeykal’s tender mercies. Herr Smeykel was neither tender nor merciful. We were sent to get Monteaura, who, like Mara, is another of the school’s levade stars. Although Melissa had specified that Herr Smeykel was to longe Monteaura a bit before Meredith climbed on, that’s not what happened. Once she swung a leg over, she was instructed to trot on almost immediately. This is a deviation from the usual practice, as I understand it, of walking for a few minutes to allow the horse to reaccustom itself to the weight of the rider on its back. Monteaura went into the trot with a lot of energy, but before poor Meredith had a chance to adjust her stirrups to a comfortable length. They were a bit too long, and the right one was longer than the left, so she immediately had a little trouble staying with the movement and got left behind a bit, provoking a levade-buck-levade sequence from Monteaura. To her credit, she stuck on, but – okay, call me paranoid– I wonder whether Herr Smeykal isn’t putting us to the test just a wee bit. The mare has a very big trot as well, and Meredith was instructed to shorten up the reins and take a good contact with her, to slow her down into a more sittable trot. This took a bit of time to figure out, since if Meredith took too much hold, the mare would come to walk, and then when she put her leg on, the horse would take off in a big trot again. It gradually became clear that Monteaura is very sensitive to the weight aids and will shorten or lengthen according to the degree of uprightness of the upper body, as well as the tilt of the pelvis. The process was complicated by the fact that Herr Smeykal speaks no English, and Meredith’s German is still rudimentary at best. I tried to translate on the fly. Meredith was instructed to canter on “carefully” from the trot and got a bit of a rocket-launch; I inferred that “carefully” is code for “the tiniest little suggestion of an aid.” Monteaura’s canter was big and bounding, and a bit painful for poor Meredith. I thought to myself, “That saddle doesn’t fit right.” I was probably right about that, but here at RvN one doesn’t have a choice as to saddle; the horses each have their own and that’s that. If it doesn’t fit the rider, tough! In addition, most of them are practically antiques with no padding left in the seat. Once back home again, we had some soup and salad for supper, and then I turned on the TV to find a live broadcast of the memorial service for the Columbia astronauts, televised from Houston. (I don’t think I mentioned it before, but the morning after we arrived, there was a newspaper sitting on the table in the Gästehaus foyer. Its headline was about the Columbia’s crash. That’s how we got the sad news about this tragedy.) So I’m sitting here listening – President Bush is speaking now – and feeling very far from home. I remember when the Challenger spacecraft was lost, and how I heard the news in the elevator during a break between classes at Texas A&M. Classes were dismissed for the rest of the day because one of the astronauts who had been lost was an Aggie. It doesn’t seem that long ago… and here it is happening again. My feelings are mixed: I’m proud to be an American, a citizen of the only nation still actively exploring space, but also I feel the cost of such leadership. It’s Kleenex time. Meredith is taking the long hot bath tonight, in hopes of soothing general soreness. Before we left the school this afternoon, we talked it over and decided to take only a longe lesson tomorrow; we set that up for nine in the morning. We may have to beg off the riding lesson if, frankly, we’re too sore to ride for another hour (or more; this morning’s lesson went on for 90 minutes, after all). For now, I’m going to finish this off and go to bed with the Duke of Newcastle and say a prayer that tomorrow’s report to the UN by the arms inspectors in Iraq will not herald the onset of war. Please see the end of this post: https://www.kipmistral.com/a-good-seat-three-months-at-the-riding-institute-von-neindorff-by-lynne-sprinsky-echols-part-i-in-the-series/ for more information about the author. “It is disappearing,” Michel Henriquet says quietly, looking across his dining table with a level expression that hints of sadness. It is the end of a day of talk about the rich history of “high” equitation in Europe. Pale mid-afternoon light filters through the ancient windows of Fief de la Panetière, the venerable 16th century house that he shares with his wife, Olympic and international Grand Prix champion Catherine Durand. The company has lingered long over the end of a superb luncheon while Henriquet speaks of the future of equestrian art.